The looking glass with glam. And triple magnification. Reflect on who’s the fairest of all. It’s been said that the best mirror is an old friend. True as that may be, old friends aren’t always available when we’re primping for a big night out. 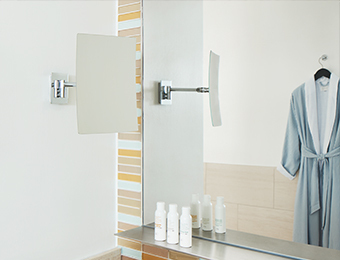 Kimpton hotels’ chic mirrors are stylish substitutes with 3x magnification to help you look your best. Choose from two finishes and two mounts.